Cute and cuddly is the theme of these tropical cats of Vanuatu. Cats come in many colours in Vanuatu and are as lovable and popular as any of the cousins the world over. The lush backdrop of tropical flowers adds to the appeal of the stamps. 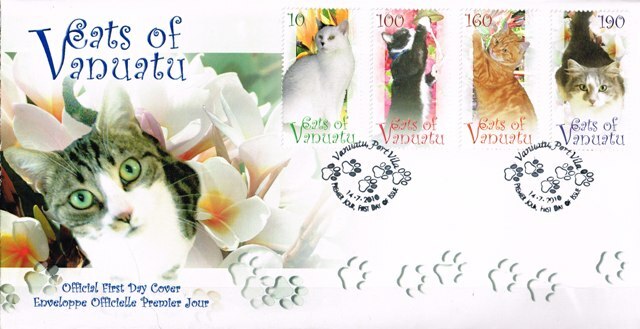 The issue features Boots on the 100 vatu stamp who is without doubt Vanuatu’s most famous cat. Boots was born in February 2003 in Port Vila to a Mother who was a bit of a floozie. Looking for a better life Boots ventured out on his own and found a pet friendly home with 2 large dogs and two territorial cats. To avoid confrontations Boots was given a job as a rat cat at the Waterfront Bar & Grill. He soon discovered that he loved the Waterfront and the fresh fish but hated rats. He then applied for a position of entertainer. After trying different acts he proved his prowess in sucking a drink through a straw and ringing a ships bell as shown on the stamp. When asked he would hop on the bar, stroll to the bell and wait for instructions. He can differentiate any number up to five and ring the bell that many times and is then rewarded with fresh tuna. He also has the job of inspecting the catch on the incoming fishing boats and there has never been a bad fish since Boots has been on the job. With his pet humans, Boots has recently moved to his new home at the War Horse Saloon in Port Vila where he performs six nights a week seeing visitors from all over the world. He has been on Television and in the media in both Australia and New Zealand and is arguably the most photographed cat in the world and is honoured to feature on a Vanuatu stamp, though he wishes it was fish flavoured. No cats were disturbed in the making of this stamp issue.